Some of the "faces" of the Urban Caracal Project. Each of these caracals were radio-collared and tracked as part of the project. Update on what's up with the project: being a caracal biologist isn't always fun in the sun! Being a caracal biologist isn't always fun in the outdoors following cats! Being a biologist really means that as data are collected, we must shift our roles from field biologist to lab or computer biologist! It's been a while since we've updated what's happening on the project, so I thought I'd share our progress with an overview of what we've done and what we are doing! Beginning in November 2014, we set out to capture and radio-collar caracals in the Cape Peninsula. Our goal: to understand how consequences of urbanization in the peninsula affect wildlife populations. We wanted to know directly from the "natives" what their lives are like. Caracals are a great study species to study how humans impact wildlife. In the peninsula, they have ascended to the role of apex predators. They are vulnerable to the effects of pesticides that bioaccumulate in the ecosystem. Interestingly, they are also vulnerable to diseases carried by domestic animals like cats and dogs. Those diseases can have huge impacts on wild predators. This is one reason it is good to clean up after your dogs when you walk them in green areas, and why roaming cats can be harmful to our natural areas! Finally, caracals require a lot of space to find enough food and mates. They can therefore tell us whether habitat is sufficiently connected and how they deal with infrastructure like roads. We hoped to catch 10 caracals when we started. But soon, it was evident we would need more than 10 collared caracals. We noticed how different the movements were between males and females, and the young and the older caracals. With the amount of variation in the movements between the different collared caracals, we wanted to track at least 20 across the peninsula. So from November 2014 to August 2016, we worked hard to collar at least 20 caracals. Several individuals died soon after collaring them from disease, pesticide exposure, or being hit by cars (unrelated to the radio-collars). In fact, the mortality rate for these caracals was alarmingly high. We'd hoped to get at least 3 months of tracking data from each caracal, but some died within weeks of being radio-collared. To accomplish our goals, we actually ended up tagging 31 caracals, and radio-collaring 28 individuals, 26 of which live in the Cape Peninsula! Meanwhile we were also tracking the already collared caracals to collect data on their diet. We were on the ground nearly every day tracking the caracals and going to the places they visited (after they already left the area) to track their lives in near real-time. We were able to study what prey they eat by finding actual prey remains in the places they visited, and also by collecting their feces and dissecting the feces in the lab to see what bones and hair pass through the caracal digestive tract! See our PhD student's (Gabriella Leighton) blog for more details on the diet work! As 2016 started to wrap up, we needed to make sure that all collars were removed from the caracals. The batteries on the collars only lasted for 4-6 months, and we wanted to make sure no caracals were left with the collars on them for the rest of their lives. We used collars that have an interactive feature that enabled us to command (using a computer and specialized antenna) and activate a spring-loaded release so the collar would fall off of the animal. Some of the biggest adventures we undertook were when we were trying to get close enough (within several hundred meters) to send the "drop" signal! In mid-2017, we are entered the "less glamorous" phase of the project, which is the phase we are currently in. We have movement and diet data for 28 caracals, a lot of genetic samples from the Peninsula cats, but also all the roadkill caracals that people reported to us. We have samples for disease and pesticide testing too. Now, the project is essentially just me and a couple students. We are using all of our time to conduct labwork, analyse data, and write publications about what we are learning. I help advise a couple of PhD students too– Gabi's work on the diet, and another student working on a new component of the genetics project. I also spend time reaching out to potential collaborators to use the samples we've collected for interesting new ways to study this population. For example, we are prepping samples to ship to Arizona State University, USA to a laboratory that specializes in novel feline diseases. This means getting permits and hours worth of just organizing samples for the trip overseas. I have been enjoying spending nearly every day manipulating and analyzing in different ways to really get a good grasp of the biology of the caracals near urban Cape Town. Most people don't guess, but it will actually take me more than a year just to analyze the datasets and create the manuscripts for publication that will be the key step to answer the questions we started out with in 2014! Things are coming along nicely and the more I learn by working with the data, the more I love those urban caracals and have respect for their resilience and ability to persist in the Cape Peninsula. Stay tuned as we make headway and can tell you the big-picture stories we are discovering. Thanks for your continued support and interest! Please come support us at our upcoming benefit concert! We will be selling caracal wine so bring some bucks, and if you have burning caracal questions, come say 'hi' after my presentation and ask away! Hope to see you there! We released Prospero from his chains, but will he stay free? This video features some of Prospero's story, as well as more information about the project. Thank you Justin and Eugenie Bonello for your help with putting this excellent video together! Please help us reach a goal to raise R70,000 to support the work of our PhD Student Gabriella Leighton. We are planning to pesticide exposure testing on samples that we have already collected. You can donate through direct deposit to University of Cape Town's Institute for Communities and Wildlife in Africa. 100% of your funds will be put towards project expenses with no fees incurred. For donations of more than R1,000, a 18A tax certificate is provided. Thank you! Once a deposit or electronic payment has been made, please notify us by email at giving@uct.ac.za and Laurel@CarnivoraConservation.org explaining what the donation is for. This time last year, if someone called me to report a caracal caught in a gin trap in an affluent part of Cape Town, I would've thought it was one of those fluke rare cases. But the longer I work on the Urban Caracal Project, I am realizing that the struggle to live in harmony with wildlife is more pervasive than I could've imagined. My fear is that the story of our 26th caracal, Prospero, is not rare. I was at home asleep for the night on a Saturday a couple weeks ago and woken at 11 pm by a phone call from a local community member. The request– "please come help – a caracal is caught in a snare and we don't know what to do...." A bit groggy, I started to ask questions– a snare? Where are you? Did you set the snare? Is the animal severely injured...??? They didn't have answers, and it didn't matter. Quick action was the most important thing, and not just by me. The family that called me, renters in a home nearby where the caracal was illegally caught, were just as surprised as me by the circumstances they found themselves in. And they are to be applauded for mobilizing to action in every way they could. They got in touch with one of our project vets, Dr. Aimmee Knight, so that she could bring the drugs I would need to dart Prospero. They also called Megan Reid, the Wildlife Unit Coordinator for the SPCA. Along with Urban Caracal Project field team manager Joleen Broadfield, we quickly gathered so that we could set Prospero free. Photo of Prospero caught in the trap. Photo taken by the vet, Aimmee Knight, assisting with his release. When I arrived, I saw immediately that Prospero was actually caught in a gin trap that was affixed to a shed with rabbits. It was unclear if whoever was tending the rabbit shed was having issues with predators killing rabbits. In these cases, the best tactic to keep the rabbits or other pets safe is actually to reinforce the shed. But as is a story I've heard now so many times, rather than reinforcing the shed they were choosing to persecute any potential wildlife that got close to the shed instead. A photo of the trap that Prospero was caught in. Gin traps are just one method that people use to persecute wildlife. Snares are cages are also used by landowners, and while gin traps and snares are more dangerous for wildlife than cages, the use of cages during animal capture and translocation also carry risk of injury for wildlife. Prospero had fought himself to exhaustion in his efforts to break free. And further fighting meant that he could seriously injure himself beyond what the trap itself did to his paw. I could see he was caught by just a few toes. Because of this I was optimistic as I loaded my dart that if I could quickly drug him and get him out of the trap, he could be released somewhere safe, possibly even that night. When I approached Prospero to dart him, he lunged and jumped around, trying to get away from me. He was terrified. I was quiet and calm so I could slowly sneak close to him. He calmed down a bit too and finally I had my shot. I blew into my blowpipe and the dart hit him square in his flank with a lucky perfect first shot. Within 10 minutes, he was asleep from the immobilizing drugs. Aimmee and I immediately released him from the trap to start assessing the extent of his injuries. Our examination revealed he had been caught by only two toes. During his efforts to get free he had clearly dislocated them, and it was possible that they were broken. Prospero was caught on his right paw and sustained few injuries. We decided to take him to Aimmee's clinic to get x-rays on his foot before we would make the next decision– release him that night, or take him to the SPCA to give him a chance to recuperate the mobility in his foot before release. Putting wild animals in cages is stressful, and we wanted to choose carefully for Prospero and minimize the time he was stressed. Prospero on the Xray table being examined. We conducted the xrays and the Penzance Veterinary Clinic and found that he only had 2 dislocated toes that Aimmee was able to reset. We decided Prospero could still benefit from a couple days in rehabilitation. We wanted to ensure that he could move on his foot before we released him back to the wild where he would have to hunt on his own to survive. Within three days, Prospero’s foot healed nicely and he was in excellent condition. He is an adult male caracal that weighed 13kg– what we typically see in full-grown males in the Peninsula. We fitted him with a collar, and loaded him up in the SPCA bakkie. We then took him to a protected area in Table Mountain National Park where, with permission from SANParks, we released him. Prospero was fortunate in so many ways. But not all caracals, or other wildlife that are illegally trapped, are this lucky. I am learning that the frequency with which landowners choose to take persecutory action against predators is shockingly high– and seems to be the first stop measure taken to try to resolve conflict with neighboring predators. 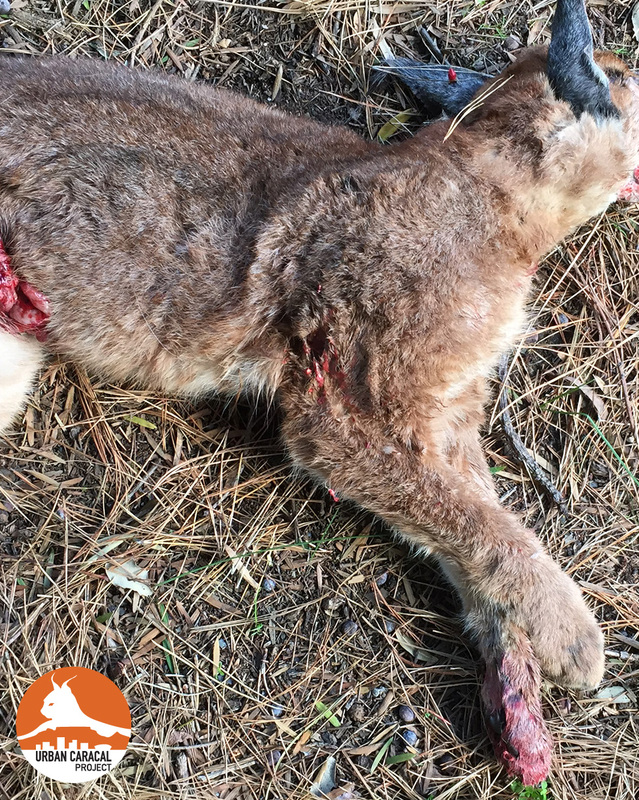 Last week we received 7 different calls about caracals causing trouble by killing cats, chickens, sheep, duikers, and grysbokkies! Each person calling requested we trap and relocate the animal, even in the case where caracals were doing what caracals do: prey on native species like grysbok. All of these animals that were attacked by a predator were roaming free and caracals were blamed every time. But there are predators, other than just caracals, that will also take advantage of an easy meal of chickens or domestic cats. And so even if we rid the landscape of caracals entirely, the problems would persist! The only solution is to protect your pets and livestock like you protect your family- keep them safe inside, especially at night. We often imagine this type of human-wildlife conflict to be far away in farmlands, but it hits close to home even in the city. Many people live near those green spaces because they appreciate nature and the beauty of the mountains. Predatory species play an integral role in that beauty that we desire; yet many residents only want a slice of the beauty without taking it as a complete package. With ever-increasing habitat loss and encroachment into the areas that wildlife occupies, we are creating this conflict that surprises us. We are transforming wildlife habitat into homes, concrete driveways, and roads. We are fragmenting the landscape with electrified fencing. In this landscape we are so drastically modifying, we are also introducing domestic animals that are vulnerable to predation if they roam around free. We are creating novel ecosystems in which predators are forced to adapt to or perish. Those predators that struggle to adapt to the rapid loss of their own habitat, and loss of their own natural prey when the habitat loss occurs, will opportunistically prey on easy meals of free-roaming geese, ducks, lambs, and domestic cats because it is their biology to do so. So, in areas where many pets or livestock roam free, it attracts many other predators too that are also trying to adapt. By trying to shelter and protect our animals as much as possible, there's less enticement for a variety of predators. Propsero's story, luckily, hasn't ended thanks to the community that supported his release– the SPCA, the family that called, Penzance Veterinary Clinic. We have been monitoring his movements using his radio-collar, and find that he largely "hangs around" the area where he was initially caught in that gin trap. We hope that he lives a long productive life given this second chance, but that will rely on us, as a community, also changing the way we interact with our environment. We lose our humanity when we choose predator persecution as the first-stop solution. By promoting the safety of our domestic animals, we also promote conservation. And by keeping pets like domestic cats indoors more, we reduce the risk of death due to the primary cause of death for free-roaming cats– being hit by cars. Many feel that keeping pets and livestock sheltered is mission impossible, so the best we can recommend is that we accept the risk that domestic animals are vulnerable to death because of a variety of reasons. If we let our cats roam free, we accept the risk they may be hit by a car, and so the same is true for being vulnerable to predators.